20Twenty is a monthly instore event that starts on the 20th of the month, runs for 20 days, and features exclusive items from 20 designers at 20% off the normal price. This is a wonderful way to showcase some amazing designers, and Avatar Bizarre is happy to be included in the October edition of 20Twenty! There is no theme for the event, but I decided it might be fun to make a Japanese kimono for this round. There will be a couple of new kimonos available at Avatar Bizarre, and they cost 275L each, but the 20Twenty version on sale for 20% off will be the Hibari kimono, which features a pair of sparrows in the branches of a cherry tree. The kimono comes in six sizes (5 female, and one flat chest femboy size), and includes an unrigged obi bow and a color HUD with several color choices. It is materials enhanced, and should fit most mesh bodies with their included Alpha HUDS. In fact, my model, pictured above, is wearing the Maitreya Mesh Body. If my math is correct, 20% off 275L is roughly 220L. While the Hibari is on sale, there are two other kimonos available (Ryu and Sakura), which will be full price. 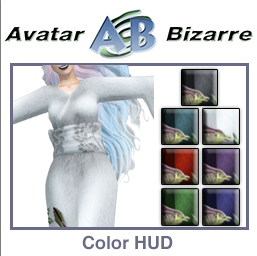 All Kimonos come with their own color HUD.